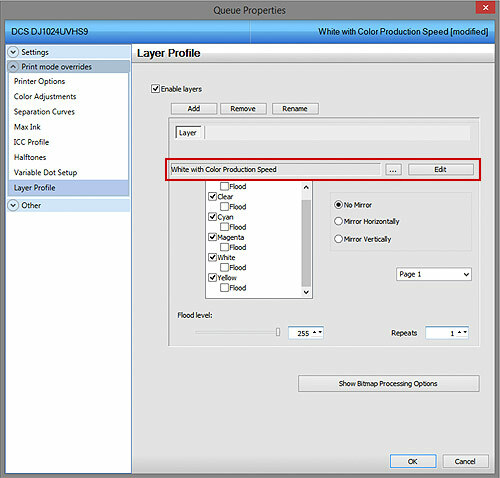 The biggest difference between a queue or job with layer profiles enabled and one without them enabled is where to make print mode selection changes and print mode edits. 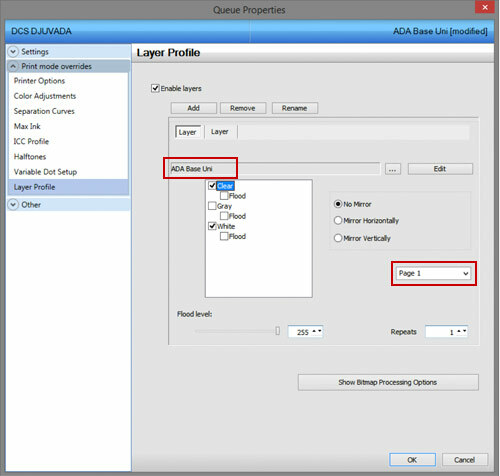 The default print mode for the queue or job appears in the dialog box below. In this case, White with Color Production Speed. To change a print mode for a job that has layer profiles enabled, double-click the job, go down to Layer Profile and select the ellipsis (…) icon. This will open the Manage Print Modes dialog box. From here, the print mode can be changed. Changing this print mode on the Queue Level will change it for every job imported into the RIP from that point forward. Changing the print mode on the Job Level will only change the mode for that job. 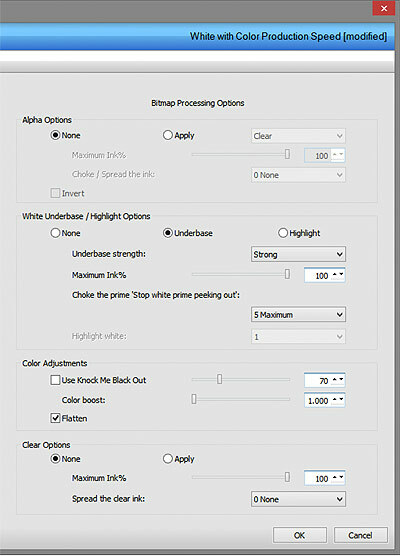 To edit the print mode for the particular job, select Edit and the print mode overrides will appear. Bitmap processing options will ONLY apply if the job that was sent to the RIP was done so via Print with Underbase from an application. The appropriate options will already be set in the queues when they install. Below is brief description of what each option does. Alpha Options: Used for special printing from 3rd party applications. Set an ALPHA channel in your design and you can print that channel with either Spot Clear or Spot White only. White Underbase: Choose to underbase all objects in the file with White ink. Keep underbase strength at Strong at all times. 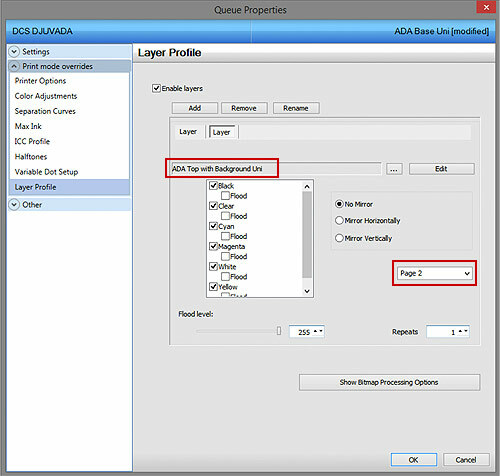 Use the Choke feature to control size of the underbase layer. White Highlight: Use Spot White to print the highlight areas of the image instead of knocking them out and having the substrate show through. Choose the strength at the bottom. Clear Options: Turn on when printing with a queue that has FINISH in the name. Ability to spread this coat by pixels. Layer profiles can also be used to output multiple-pass jobs and multiple pages, the way all ADA queues are set up. Below are the 2 layers that were created for this job. Layer 1 uses a certain print mode and receives its information from Page 1 of the file. Layer 2 uses a different print mode and receives its information from Page 2 of the file. This can be done with any queue and any print mode. This is helpful if multiple passes are required and need different print modes.